Here is one of the cards I made for Eyelet Outlet this month. Be sure to check out their site for some wonderful and unique brads and eyelets. 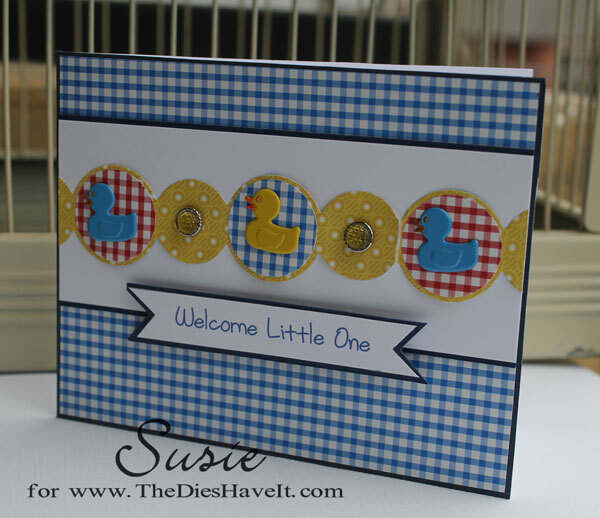 I wanted to share this sweet little baby card with you and show you how easy it is to make a linear card that still packs some punch, so out came the duck brads. They are so bright and cheerful that they make the card pop. On the smaller circles I used some yellow stippled jewel brads. I just love the clean lines of this card with such cuties swimming across the front. I hope this card brings a smile to your face today. I am going to show you another brad-filled card tomorrow. So sweet and a good use of patterned papers. Love it!